The leaders of the Polisario can no longer hide their panic at the end of the 5th African Union-European Union summit held last week in Abidjan, where their sole consolation was to obtain a seat among the participants, despite opposition from Morocco and Côte d’Ivoire, the host country. But, what concerns most the Polisario, a resident in the Rabouni camp told us over the phone, is the unexpected rapprochement between Morocco and South Africa, at the historic meeting in Abidjan between King Mohammed VI and the South African Head of state and President of the African National Congress (ruling ANC), Jacob Zuma. The two heads of state have actually decided to restore diplomatic relations between the two countries and relaunch their bilateral cooperation. This rapprochement is viewed by analysts as paving the way for Pretoria’s withdrawal of its recognition of the so-called sahrawi republic “SADR”. This normalization may also encourage other Southern African countries to follow suit and seek to get closer to the North African Kingdom, much to the distress of the Polisario and its Algerian sponsors. 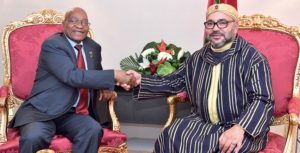 Last Sunday (Dec.3), Jacob Zuma told local media, that “Morocco is an African country with which we need to have relations”. He said South Africa had never had problems with Morocco, and that it was Rabat that decided to call back its ambassador and break off relations with Pretoria. Moroccans “have helped us a lot,” he confessed, recalling Nelson Mandela’s particular respect for Morocco’s support for the South African people and the ANC during the struggle against the apartheid regime. Since it returned to the African Union in January 2017 and since it applied for membership in ECOWAS, Morocco has changed the empty chair policy for an offensive diplomacy to better defend the Sahara dossier in Africa, and thus pull the rug out from under the feet of the separatists. Morocco has thus become a key player on the African chessboard.